Jim Rickards wants to remind you that you can’t erase, hack or delete gold. Why is he making such a point of this? This week, Your News to Know provides you with the hottest topics in the gold market and the global economy. Stories include: Why gold is an investment that lasts, expert predicts gold will hit $3,000 per ounce by 2019, and HSBC analysts are now bullish on gold. In his book called “The New Case for Gold”, author James Rickards argues that the yellow metal is quickly becoming the best asset one can own with the future in mind. Talking to Fox Business, Rickards called gold “the best performing asset in 2016” and “the best performing asset class in the 21st century” despite the metal experiencing losses over the last couple of years. And what is it that makes gold so valuable? For one, the possibility of a looming recession: Rickards sees weight in Donald Trump’s recent recession comments and states that he would rather listen to an executive than an economist. “The Fed has never predicted a recession, we’ve had many,” said Rickards. Indeed, Rickards urges investors to forgo paper gold such as ETFs or futures and to focus on physical gold instead. “You don’t want paper gold, you don’t want ETFs, COMEX futures or London Bullion Market Association unallocated gold. The reason is they are all paper contracts. When you most want the gold, they’ll terminate early, close the exchange, the Comdex will say ‘trade for liquidation only,’ you won’t be able to get the physical. They sell 100 times more gold than they have and that’s okay because futures exchanges always have large open interest,” he says. Aside from serving as protection, gold’s appeal also lays in its risk-free properties. “I recommend 10% of your investable assets. If I am wrong and gold does nothing you won’t get hurt with 10%, but if I’m right, if everything else crashes, or if Trump is right, gold will go up by multiples. So, that’s your insurance for the rest of your portfolio,” Rickards added. In a speech at The Dubai Precious Metals Conference in the United Arab Emirates, precious metals expert Diego Parilla said he expects gold to reach $3,000 per ounce by 2019. Parilla sees gold getting there thanks to a “perfect storm” being created by central banks: “The big problem is that monetary policy is contagious and central bankers no longer have any bullets left (…) [They] have no room to ease aggressively as they are already stretched,” he explained. As seen on Mining.com, certain factors already seem to support Parilla’s beliefs: The Fed halved their rates hike expectations in a March meeting amid concerns over the global economy, which has caused gold prices to climb in recent months. Likewise, the gradual rate hikes have weighed on the greenback, increasing the appeal of dollar-denominated gold to holders of other currencies. Independent research firm Capital Economics also sees a bright future for the metal: The company’s analysts predict gold will reach $1,350 by year’s end with a rising trend in 2017, quoting low real interest rates and a soon-to-plateau global mine output as the main reasons. 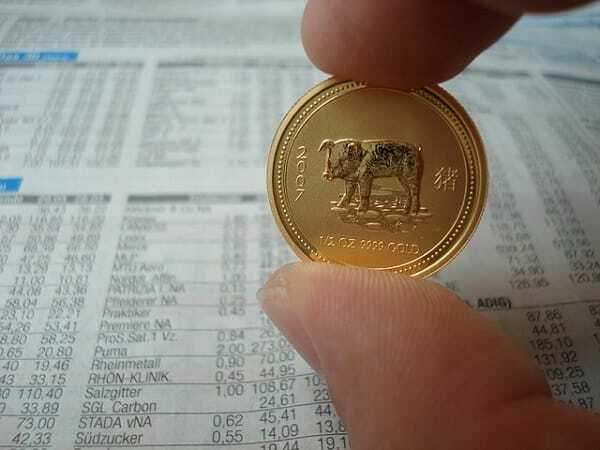 Business Insider reports that gold is the only asset HSBC experts were bullish on in their latest analysis. Murray Gunn, head of HSBC’s technical analysis, expressed a bearish stance on many U.S. stock sectors, with motorcycle manufacturers, agriculture and apparel being among the most pessimistic. Gunn follows a form of analysis called the Elliott Wave Principle which dictates that investors move between periods of bullish and bearish thinking in recognizable and consistent patterns, thereby manifesting a form of herd mentality. According to the Elliott Principle, each cycle starts with five bullish moves that eventually push prices to a new high and ends with three bearish moves that push prices lower. Gunn believes that gold has hit the bottom of its recent down cycle and sees the recent price gains as indicative of a new and substantial upwards trend being formed, naming $1,500 per ounce as the “initial target” of the metal’s current uptrend. What would happen if everyone placed just 2% of their money into gold? Find out here.